An exhibition of paintings spanning a lifetimes exploration into evolution both personal and scientific. 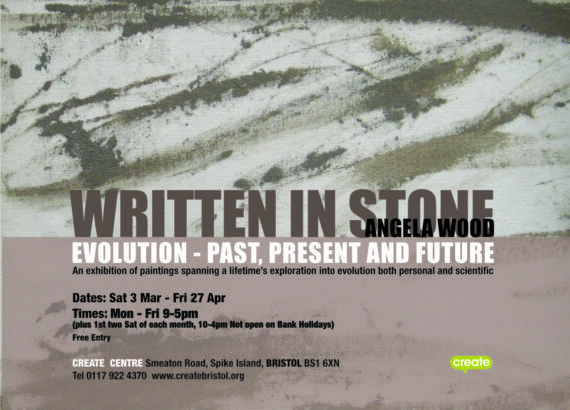 Angela Woods exhibition on evolution has three distinct sections ‘Once Upon A Time’, ‘Conscious Creation’ and ‘Future Expectations’. This collection demonstrate techniques developed from her personal experience of the creative process through art, dance and music, alongside her observations of creation itself. This exhibition is open weekdays and Saturdays April 7 and 14. For more information http://www.createbristol.org/events.htm The Create Centre has parking on Saturday or midweek in the car park opposite.